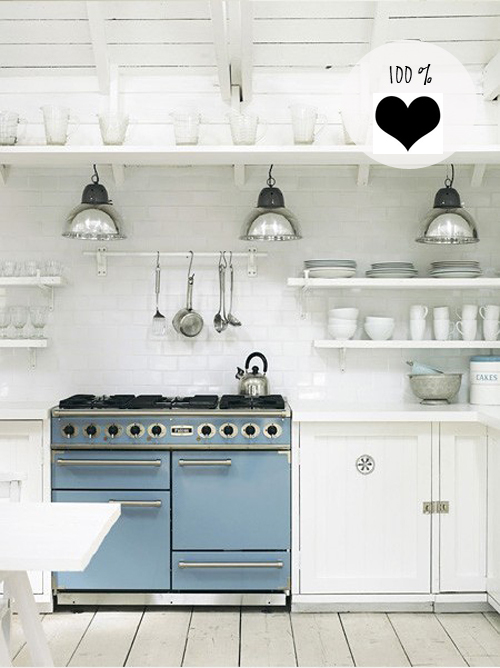 Today I’m loving … this white kitchen with a light blue stove. 200% love!! I want that stove!! I really love this types of stove on the white kitchen! I want this immediately to decorate my kitchen amazingly. I have seen many types of stove but this is really extraordinary to me. 400 percent love for this stove!!! This is an amazing shade of blue! I never thought of using the stove to make the kitchen pop. Very pretty. Love the wall and the ceiling… and the kitchen of course! What a charming way to make a statement in a neutral kitchen. The shade of blue is so pretty it just might make you excited to cook! just perfect! I like stainless steel but this stove much more unique! I love this blue – I’d call it “duck egg blue” I currently have my living room painted in this colour with minimal/simple white furniture. You’d think it might appear cold but it doesn’t at all! Very cool idea! And I looooove that blue! I covet those whom have a chance to dine in this kitchen.l wish l wiil one day. This is my dream kitcheni. The pleasant time in there to cook and bake. I just love it!! !